This is the month of light. For the first time since October, the sky is bright in the morning. On a clear day, the sun reflects brilliantly off the snow, and although the temperature remains Alaskan cold, the radiance is a welcome change from the dark hours of the past months. You also brighten our winter, with your prayers and your financial support. Thank you so very much for your continuing help. We cannot say it often enough: it is you who keeps our mission alive and strong. Our broadcasts around the clock, our thousands of spots, our hours of information and companionship, our airing of the Rosary and the Mass, our many awards, they are all thanks to you. We sincerely appreciate your kindness. DRIFTING AWAY: Last month, we mentioned the early winter lack of snow. That’s no longer true, as KNOM engineer Les Brown will attest! 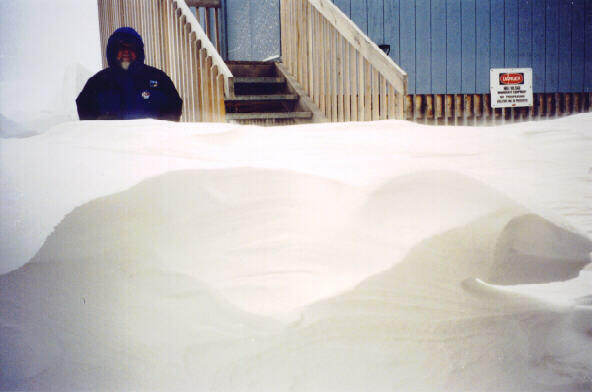 At our remote transmitter site on the tundra 3 miles east of town, the brutal wind packs the snow into hard, sculpted drifts. top DOG TIRED: That will describe the KNOM staff by the time you receive this newsletter, as we’ll be in the middle of the Iditarod Trail Sled Dog Race. A record 94 teams have entered. Whew! Local businesses paid for airline tickets to Anchorage for news director Paul Korchin and volunteer Michael Warren for the start, and Paul was set to fly the trail. Back in Nome, former volunteer Linda Raab flew in from Portland, Oregon to help cover her 13th Iditarod. (En route, her jet made a thrilling emergency one-engine landing in Kotzebue, Alaska!) Coordinating coverage is general manager Tom Busch, for whom this Iditarod is his 27th. Tom, Paul and Michael were scheduled to greet every team live on the air, around the clock, with everyone on the crew having an important role in the coverage. March was once known as “suicide month” in rural Alaska, and we believe that KNOM’s consistently exciting Iditarod broadcasts are one solkd reason why this is no longer the case. How exhausted will we be? Please stay tuned! along the Iditarod Trail since 1993. Originally from Braintree, Massachusetts, George visited Alaska in 1959 and moved to the state in 1965. 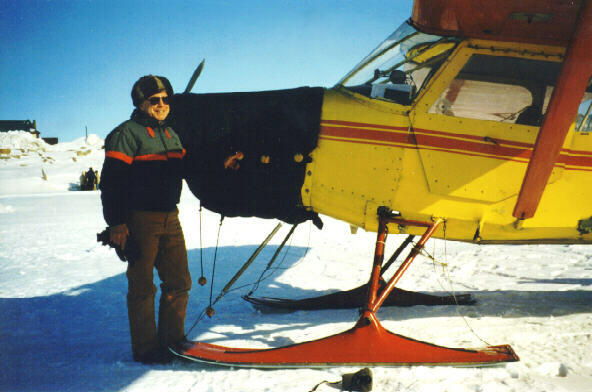 After learning to fly, George worked for many years as project engineer for the Alaska Division of Aviation, building airports in the remote bush. He’s flown the Iditarod Race every year since 1980, hauling people, supplies and dogs, and was chief pilot of the official “Iditarod Air Force” in 1992. The warm and friendly George is a highly skilled, safe and cautious pilot, and everyone on the staff enjoys the opportunity to visit with him at the end of trail each year. INSPIRATIONAL SPOT: We must learn from the mistakes of others. We cannot possibly live long enough to make all the mistakes ourselves. top EVEN HAMMIER! Congratulations to volunteer Michael Warren, who became the fourth member of the present KNOM staff to earn a ham radio license. Michael’s call sign is KLØVQ. He joins Les Brown KLØOG, Florence Busch KLØQC, Mike Nurse KLØUJ and old, old-timer Tom Busch NL7H. Yay, Michael! CELEBRATE! This is the season for the traditional Alaskan potlatch, an Eskimo and Indian custom with origins in antiquity. Four months of snow has been hard packed into long trails between villages, and although it’s close to the coldest part of winter, the extra hours of sunlight make travel safer. One by one, villages host these celebrations for their neighbors, with songs and traditional dances late into the night, and in some villages, spreads of traditional native foods. Every guest receives a gift, and in the old days, villages would try to out-give each other at successive celebrations. Out of ignorance, the U.S. government outlawed potlatches in the 1880’s, and they were revived in the early 1950’s. 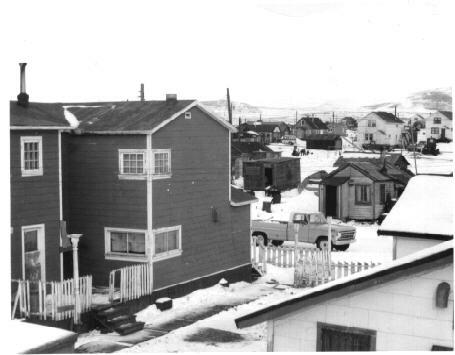 Join us on the Internet, with Nome Static photos in color, many back issues, information on volunteering, over a hundred historic pictures, a list of our awards, and more. CRYSTAL CLEAR: KNOM is among 44 radio stations to be nominated for a Crystal Award for Excellence by the National Association of Broadcasters! NAB will select ten winners on April 11th. Can you imagine how excited we are? KNOM was awarded a Crystal in 1987, the first year NAB presented the award. Please stay tuned! INSPIRATIONAL SPOT: The church calls attention this Jubilee year to our family, our community, and our participation in them. Our church challenges us to socialize in ways that support and strengthen Christian families. Participation and pitching in when help is needed is vital to healing Christian communities. THIRTY YEARS AGO: After seven weeks of design work that included two trips to Anchorage to consult with Augie Hiebert’s KTVA-TV engineers, volunteer chief engineer Tom Busch finalized the studio design on March 30, 1970. Tom drew the plan on sheets of heavy brown wrapping paper. HIGHER POWER: The vote among our mission’s donors is running about 5-to-1 in favor of our pursuing the possibility of fulltime 25,000-watt operation. Many of our contributors expressed concern about increased expenses, but many others pledged to make it financially possible. We’d need the formal approval of two stations on the other side of Alaska who are near us in frequency. As to whether they would agree, that’s up to a Higher Power. INSPIRATIONAL SPOT: This is a story about four people named Everybody, Somebody, Anybody and Nobody. Everybody throught Anybody could do it, but Nobody realized that Everybody wouldn’t do it. top IRON DOGS: Can you picture driving a snowmobile from Anchorage to Nome, then turning around and proceeding to Fairbanks? That’s what the Iron Dog 2000 teams did, and at breakneck velocity. 66 snowmobiles started the 1,971-mile marathon in teams of two, and due to breakdowns only 42 finished. Not counting mandatory rests at certain checkpoints, the winners tore across the almost two thousand miles of wilderness Alaska trail in an astonishing 41 hours! Thanks to grants from local snowmobile retailers, KNOM was able to send volunteer Michael Warren to the finish line in Fairbanks, and the event brought great color and interest to the KNOM air signal. 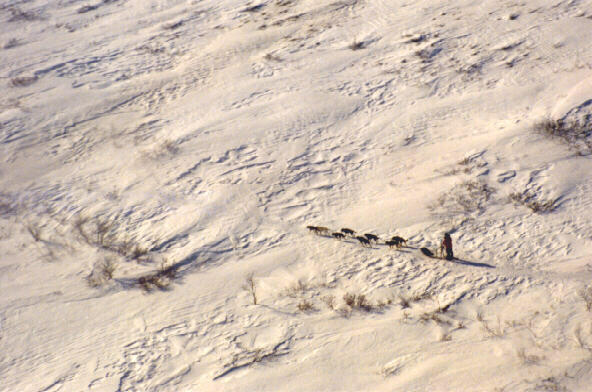 MUSHY (left): A local team gallops near King Mountain, seven miles north of Nome. From small kennels to the big Iditarod teams, the dogs are bred for a love of running and pulling. INSPIRATIONAL SPOT: May the gentle breezes comfort you and yours. Let the spirit of happiness brighten your day. May you receive and develop the power to grow. Let your heart be strong, accepting life as it happens, with courage to correct things that you can. And may God’s guidance help you do what’s right, to love others in His Name. top Thank you to everyone who mentioned that they are praying for the victims of the Alaska Airlines crash and their families. On board that flight was Morris Thompson, a beloved Alaskan leader who had retired just one month before. It was Thompson, as head of the Bureau of Indian Affairs, who cut through two years of bureaucratic delay and paved the way for KNOM’s construction 30 years ago. The crash was a reminder of our mortality. As a hobby, KNOM old-timers routinely check the “tail numbers” of jets on which they fly. Upon learning the tail number of the downed plane, we realized that Tom and Florence Busch and Les Brown had all flown on that particular aircraft within the past year. Whew! Several of our mission’s benefactors have suffered great losses recently, and a few have received great blessings of various kinds. Please continue praying for our work, won’t you? And for strength and well being for everyone in the KNOM family. Thank you for your prayers and your generous support!